If you are looking for ways to stop chihuahua separation anxiety, you have come to the right place. Separation anxiety can be very stressful to the dog as well as to the owner, but there are ways to overcome it. It is easy to forget that a chihuahua is, in fact, a dog. It is so full of character that we tend to assign human emotions to it. Everything a dog does must to be viewed in the context of dog behavior. Dogs are not nearly as complex as humans like to make out. Once you understand how a dog thinks, solving behavioral problems like separation anxiety is a much easier task. Problem 1. Does your dog think he’s the pack leader? The answer to this question could be the very reason why separation anxiety is an issue. Dogs, even Chihuahuas, are pack animals. This means that they need to know where they stand in relation to their pack. In domestic dogs, the owner and family represent the pack. If the owner does not assert himself or herself as the alpha leader, the dog automatically has to fulfill that role. In his eyes he has no choice. Now imagine how stressful this becomes for a tiny chihuahua. Every time you leave the house without him he will be frantic because he has no way of controlling your movements. Problem 2. Do you make a big fuss when you leave home and when you come back? Long goodbyes and reassurances work with a child, but not with a dog. In fact, a dog needs the opposite treatment. You should ignore home for 10 – 20 minutes before you leave and for at least the first 10 minutes after you get home. This way a dog comes to understand that your coming and going is a natural phenomenon and nothing to be worried about. He also gets the idea that you are in control. Problem 3. Does your dog spend too much time on his own? Dogs are social animals, especially Chihuahuas and cannot realistically be expected to behave themselves for long stretches of time alone. Find a playmate, like another chihuahua, to stop chihuahua separation anxiety if loneliness is the cause. Alternatively, consider doggy day care or pay someone to pop in and spend some time with your pet. Problem 4. Does your dog get enough stimulation and exercise? Even if you do spend enough time with your chihuahua, you may not be providing him with enough physical and mental stimulation. 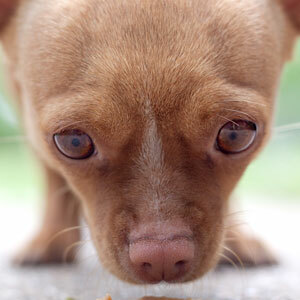 Chihuahuas are intelligent dogs and they need more than just food, petting and company. Daily walks are essential for keeping them fit and happy. Socialization with other dogs and people is also an important part of providing some interesting activities. Owning a dog is a big responsibility and should not be taken lightly. Stop chihuahua separation anxiety by seeking to understand what your dog is trying to tell you.